If you’re visiting the Air Capital, or have family and friends who are, why not stay somewhere fun that captures something about Wichita’s character? Check out our top ten unique Wichita bed-and-breakfasts for your next business trip, vacation, staycation, family gathering, or weekend away from it all. A beach house, in Wichita? You bet. The Beach House at BrightWater Bay overlooks your own private lake! Play volleyball on the beach, make use of the outdoor grill, or just chillax on a lounge chair and listen to the sounds of the water. The Beach House sleeps up to 11 people and is the perfect place to bring your family and friends (family reunion weekend, anyone?) The affordable rate also makes it nice as a quiet weekend getaway for two, a place to spend some alone time to recharge, or an alternative to the same old hotel for business travelers (close to all the best area golf courses, too). Love watersports? Pair your Beach House reservation with lake access and get out on the water with kayaks, wave runners, or your own boat. It’s the game room you always wanted, but never got the chance to build. Studio C Speakeasy features a lounge and game room with billiards, darts, bean bag toss, and a 50” flat screen TV. Not enough excitement for you? Old Town is within walking distance. Afterwards, hit the sack in one of two bedrooms...one of which is accessed by a hidden staircase. 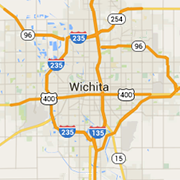 Have friends or family visiting Wichita for the first time? This sweet little home is close to everything and has an aviation theme in keeping with Wichita’s rich aerospace history. It sleeps two to four people and has all the digital amenities. You get access to the whole house, plus the fenced-in yard—a comfy little home away from home. Want to channel your inner woodsman or fairy tale princess, without leaving city limits? Enjoy the sights and sounds of ducks, deer and other wildlife surrounding the natural pond at Chateau at 220. Unwind by the wood-burning fireplace or relax in the hot tub. This AirBnB is perfect for a romantic weekend or family gathering, with rental options ranging from one room to the entire home. Why stay just anywhere when you can stay in a Wichita icon? From the bright red grand piano sculpture in the front yard, you know this mid-century home is something special. While the home was built in 1938, the room has all the modern amenities you need. When you want to rough it...but not really. “Mable” is a fully restored 1965 Jet camper that is packed with charm and everything you need to get away. It sleeps four people. You can even have Mable delivered to your reserved campsite and set up for you. You get all the fun of camping without the two hour production that is setting up your campsite. From the same fine folks who brought you Mable, here is Linus—a fully restored 1968 Shasta camper. Like Mable, Linus sleeps four and can be brought right to your reserved campsite. Head 20 minutes southeast of Wichita to Udall to the Basketball Barn, which contains a one-bedroom apartment and regulation half-court basketball court. The Barn is perfect for traveling teams or small groups, or for anyone who wants to get away to play. It sleeps up to six. For all you city slickers who dream of farm life, there’s this country getaway near Wellington. It’s an “unplugged” property to encourage loved ones to reconnect and for all travelers to relax, rejuvenate and unwind. Listen to the quail and enjoy the antics of the farm animals. Sleeps up to four people. For the airplane lover visiting from out of town, steer them to Stearman Field Airport to stay in a modern airport hangar loft. Great for business travelers or adventurers from right here in Wichita. You can even take a Stearman airplane ride for an additional fee. Stearman Field Bar & Grill is right next door. Sleeps up to two.